FORMER US SECRETARY of State and First Lady Hillary Clinton has been conferred with an honorary doctorate from Trinity College Dublin. Clinton was one of five people recognised for what the college calls “their contribution to society”. However, the procession into the conferring hall was marked by a small number of protesters chanting “warmongers not welcome”. Those chants were quickly drowned out by the assembled crowds, who began applauding Clinton. The honorary doctorate line-up included prominent US philanthropist, Dr James Simons; president of the Confederation of British Industry, Paul Drechsler; archivist at the Irish Architectural Archive, Ann Rowan; and co-founder of the Young Scientist Exhibition, Dr Tony Scott. 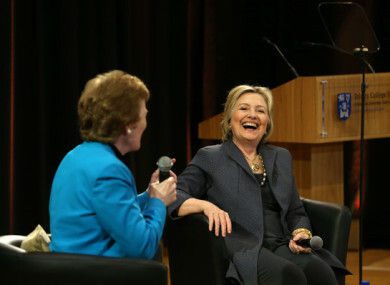 Speaking at a talk in the college this morning hosted by former Irish President Mary Robinson, Clinton urged young people to get involved in the world around them. “Now, a lot has happened since I was last in Ireland. I became a grandmother twice over, which is just about the greatest thing in the world. As you may have heard, I ran for president. That didn’t exactly work out how I had hoped. The award of the degree came against the backdrop of two protests outside the college against Clinton receiving the honour. Councillor Éilis Ryan of The Workers’ Party said that Clinton’s role in “promoting war should be reason enough to deny her this honour”. The Irish Anti-War Movement also held a protest with TCD Students for Justice in Palestine. Email “'Warmongers not welcome': Hillary Clinton heckled as she's given honorary doctorate by Trinity College”. Feedback on “'Warmongers not welcome': Hillary Clinton heckled as she's given honorary doctorate by Trinity College”.